General Dynamics bought back $14.4 billion of their own stocks from 2009-2017 driving up market value. They paid their CEO $21 million in 2016. They don't need $45 million from Maine. Bob Klotz rode his bicycle to BIW again from South Portland against a heavy wind and extreme cold. It took him about four hours. That is commitment. Today’s lesson (and it is a hard one): I have worked at BIW since 1986 and I love my job, but I worry about its future. People worry about their jobs and worry about the future of our state and the world in general. And all I want to say is we have to be prepared to listen, really listen to each other. And educate ourselves, there is always more than one side to a story. And to let ALL sides speak about their fears, hopes, and expectations. To be open to other opportunities that present themselves, we do not have to be only a ship building company, there’s a brand new world out there and we should not be afraid to experience it. Thanks to Bruce and company. You’re good people. 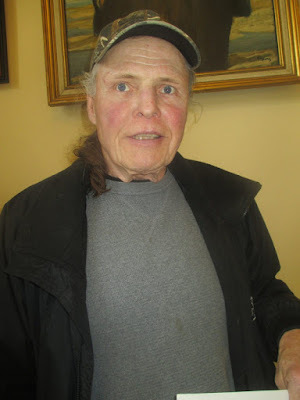 Vietnam veteran Tom Ryan from Oquossoc, Maine is fasting in solidarity to defeat the GD corporate welfare bill. As of today he has not eaten for the past 13 days and vows to continue until the bill is voted on by the entire legislature. On Thursday while in Augusta standing between the two legislative chambers he said, "I joined the service to make this country better. Our taxes need to go for human welfare – not for corporate welfare. I will continue to fast until this is over." Mary Kate Small (Camden) has been keeping a schedule of Mainers and others from away who are fasting in solidarity with our efforts to defeat this bad bill in Augusta (LD 1781). She has recorded that at least 30 others have gone without food for a day or more since February 12 when I started my hunger strike. 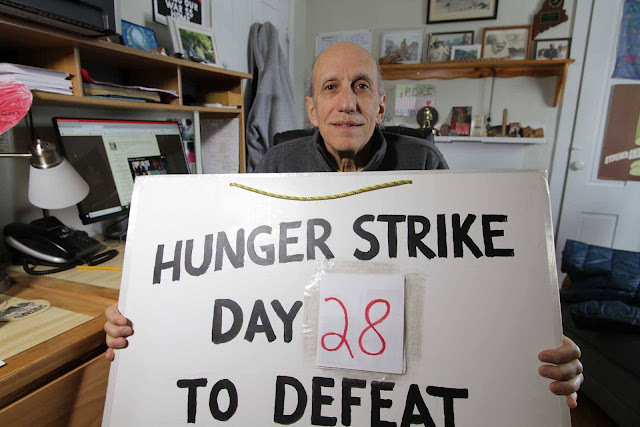 On February 12 Boryana Tacconi (Andover, Massachusetts) heard I was beginning the hunger strike and joined me for the first 20 days. Yesterday we received a message from Jeju Island, South Korea where artist and peace activist Choi Sung-Hee wrote that she would fast next Tuesday (March 20) and Thursday (March 22) when I return to the state capital to again stand against this corporate give-away. Regina Pyon from Seoul will also fast on March 20. Mary Kate informs us that she has fasters all over Maine scheduled through the end of March and beyond if needed. I thank all of those who have gone without food as we all stand in complete solidarity with the 43,000 children across our poor state who live in poverty. If the elected officials in Augusta won't stand up and fight for the kids against this mega-rich corporation that had $3 billion in profits last year then we surely must. And we will continue to daily do every thing we can to defeat LD 1781. Keep these dollars in Maine for the huge needs that are currently going unmet because of lack of funds. GD don't need our money. They already get boatloads of it from the federal government in their Navy contracts to build destroyers at BIW. Alot of people are asking me if I think the US is trying to start a war with Russia. I respond that the US and NATO want regime change in Moscow and Beijing. And our government is greedy enough, deceitful enough, desperate enough and vicious enough to go to war to try to reach that end. It's pure insanity to even consider the thought. All this daily - non-stop - demonization of Putin and Russia should be familiar. It is the modus operandi (MO) of a killer nation. We heard the same story in Yugoslavia, Iraq, Libya, Syria, Ukraine and Yemen. Demonization and then attack. The US and NATO are willing to go to war for control of everything and everyone on this planet. It is arrogance and evil wrapped into one package. I did an interview with Kevin Zeese and Margaret Flowers today on their podcast show called Clearing the Fog at PopularResistance.org We talked about our campaign going on in Maine and they asked what kind of product should be built at BIW. I responded as I always do that our biggest problem in the world today is climate change. Our weather here is all messed up like most places around the globe. 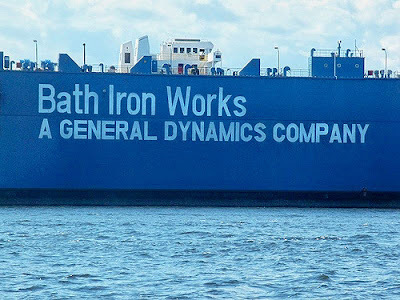 We've long been calling for the conversion of Bath Iron Works to build commuter rail systems, offshore wind turbines and tidal power systems. 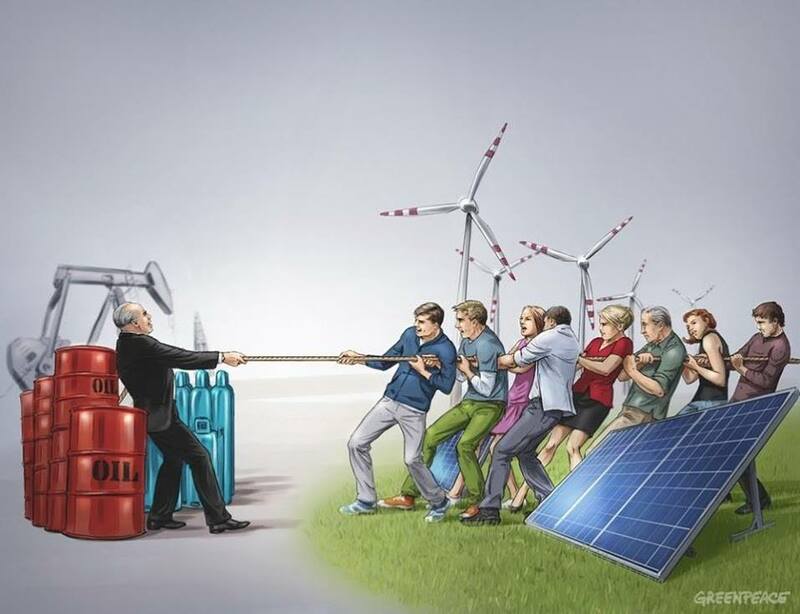 We have a short chance to have some impact on global warming - but the public must become vocal now rather than resigning themselves to no human future on Earth. Due to Trump's 'Space Force' announcement I've done some radio interviews in the last few days. Last year the House of Representatives voted to pass a bill to create a separate military service just for space. The Senate voted the bill down in Washington. The Air Force is opposed to the idea - they want to control the seamless web between the Earth and deep space. The aerospace industry sees big opportunity for profit by expanding military space operations and has much influence on Capital Hill. They are strongly pushing the bill and likely got to Trump. The Pentagon has been saying for many years that Star Wars will be the most expensive industrial project in human history. There will be no money for anything else. That is why we see them going after Social Security, Medicare and Medicaid these days. They have to defund virtually everything in order to pay for the new arms race in space. 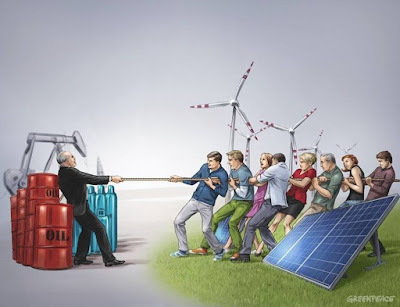 We've got to show how one issue here is linked to the other - the deadly connections Many organizers stay in their silos and don't share the full picture with the public. A big organizing mistake. We need to build unity and solidarity. Tomorrow is the weekly Lenten vigil at BIW just down the street from here at 11:30 am. People from around the state gather and hold signs calling for disarmament, human needs and conversion of BIW to sustainable technology. Studies show we'd get more jobs at places like BIW if we built anything other than weapons. Military spending is capital intensive. Every other kind of production is labor intensive. The Pentagon says that America's role in the world today is 'security export'. That means endless war. You are the citizen - you decide which way things should go. Thanks to Bob Klotz for suggesting we do the news conference and helping to organize it. We had about 17 of us this morning in the 3rd floor capital hallway between the House and Senate chambers in Augusta. Even Darth Vader made an appearance holding a sign that declared his love for LD 1781 - the corporate welfare bill for General Dynamics. We held a news conference at 11:00 am and got an interview on TV CH 8 and a call later from The Forecaster newspaper. The MunjoyHillNews.com also covered us and Carol McCracken who runs that site said she has been getting excellent responses in Portland to her recent reporting on this campaign. Our two alternative media cameramen/filmmakers Peter Woodruff (retired BIW worker) and Regis Tremblay also covered the event and will make a video report which I will post on the blog. I really felt the power of our presence in the capital hallway today. I am convinced that it is forcing this bill to stay front and center in their consciousness as the legislature faces massive human and infrastructure funding needs this year in Maine. They all know that GD does not need our feeble $45 million but they clearly understand that our state desperately needs these funds. These elected officials need to be reminded by every Maine citizen to vote against this 'bad bill'. So keep your calls and emails going to your legislators. And please get friends, neighbors and relatives to do the same. As of today we've had 118 letters, Op-Eds, radio and TV interviews in 25 Maine media outlets. (There is a good chance we've missed a few as well.) Your letters need to continue now more than ever. The bigger papers are saying they've covered this issue widely on their editorial pages and are slowing down the placement of your letters. Thus it's time to send letters to the weeklies. Often times we don't think to prioritize the weeklies but that is a strategic mistake. Many people long ago stopped subscribing to the daily papers to save money and pick up the weeklies for their news. Some of the weeklies have larger distribution than the daily papers. I was very encouraged by the response to your witness that I saw today in Augusta. Despite what we are told, most of our friends and neighbors who serve in our legislature do want to make things better and have a hard time holding their noses and voting for a bad bill. Regardless of party, there are many up there who oppose crony capitalism (as the R's call it) or inequitable distribution of wealth (the D's). If they engage with each other, they comprise a majority. I hope that continued communications from their constituents will bring them together to vote against the GD tax giveaway. You still can't put lipstick on this pig and call it pretty. Preti, [Flaherty] perhaps, but not pretty. How ironic that when the give-a-way bill was first heard, we observed the Maine DOT ask for $60 million in taxes to address the overdue infrastructure needs of our large, poor, rural state. Today's irony at Taxation Committee was the hearing scheduled for the Gov's "tax conformity" bill. 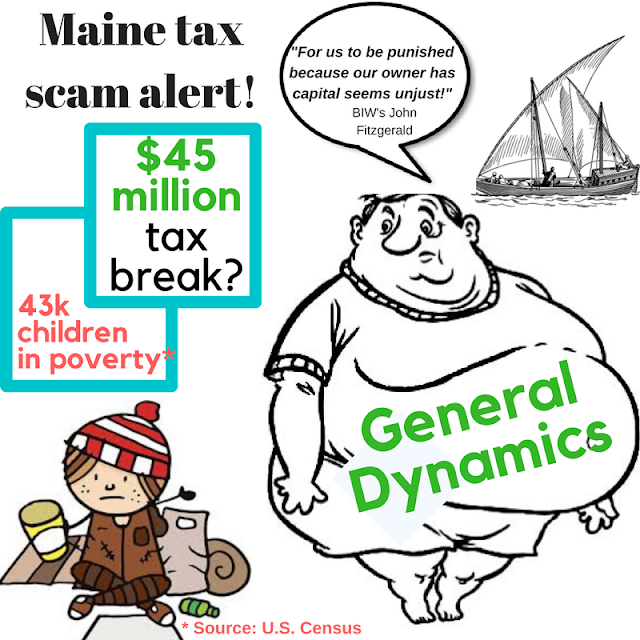 He is seeking to make Maine tax code mimic the US Congress giveaway to the rich and the corporations at the expense of the rest of us, especially our most vulnerable. It's "do as I say, not as I do" time for the D's; pulling out all the stops to oppose the Trump, Too Tax Code while handing out the same to GD. But it doesn't have to be this "race to the bottom". Keep the pressure on, keep the cards, emails and LTE's coming--make our representatives do the right thing, because it is the right thing - for Maine, her people and our democracy. Solidarity then, solidarity now and solidarity forever. I will return to stand in the hallway at the capital next Tuesday (March 20) and Thursday (March 22) from 9:30 am to noon - weather permitting. Let's keep it rolling....it's for a good cause. We will be returning to the state capital in Augusta at 9:30 am tomorrow. We've had two days in a row of snow cancellations across Maine. It's been a rough patch of weather. We'll hold signs and hand out flyers on the 3rd floor of the capital building between the House and Senate chambers while they are in session. We've also announced a news conference there on the 3rd floor for 11:00 am. We'd like to provide the media with our reactions to the Taxation Committee cutting the proposed corporate tax break to General Dynamics by 25% to $45 million over 15 years. We remain opposed to the bill in its entirety. Secondly we'd like to comment on the story about the S6 (Machinists) union at BIW declining to endorse the bill. That is a big deal and we've yet to see it covered by Maine media with the exception of The Free Press out of Rockland. I wonder why it is being ignored? Last night I dreamt about food - various kinds of lovely pizza. My energy level is dropping still and my head continues to get a bit fuzzier each day. I'm still drinking water with lemon, fruit juices, broth, and fruit smoothies made for me by MB. I've lost over 16 pounds but our scale does not work so well. My arms and legs have gotten quite thin. The best thing about this hunger strike is that it has given me the feeling of serenity I've needed to get through this very intense campaign which has now lasted for two months. I'm truly grateful for all the Mainers who have worked so hard to make this a successful effort. It's not over yet - we'll give it all we have until the end. Israeli forces physically tried to prevent medics from treating injured Palestinian demonstrators near the illegal settlement of Beit El in the occupied West Bank yesterday. It is outrageous that US citizens are providing Israel billions of dollars to carry out these illegal and immoral attacks against the Palestinian people. It's also outrageous to know that many US police departments are being trained by Israel's fascist military forces. I am certain this is happening because Washington intends to treat black, Hispanic and poor people in general this same way as our economy heads for collapse. There are millions of superfluous populations in this country - no longer needed, no longer wanted - and they will be continually harassed, marginalized, beaten and jailed. The US role in the world is 'security export' - that means making and selling weapons and sending our poor and unemployed youth around the world to kill and die for resource extraction corporation interests. 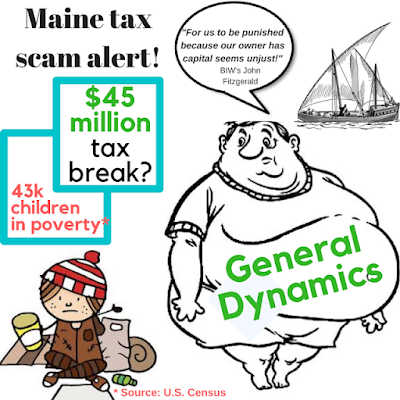 Last Tuesday (March 6) Maine's state legislative Taxation Committee held its final Work Session on LD 1781 - the corporate welfare bill for General Dynamics (GD). We were shut out of the meeting as BIW workers were bused in two hours prior to the start in order to fill all the seats keeping everyone else out. So several of us sat in the hallway while others went into a room across the hall where the hearing was piped in. Most of the hearing was the sausage making process of talking about amended language to the bill. In the end committee members voted 9-2 'Ought to pass' which in Maine is a recommendation to the full legislature in favor of the bill. 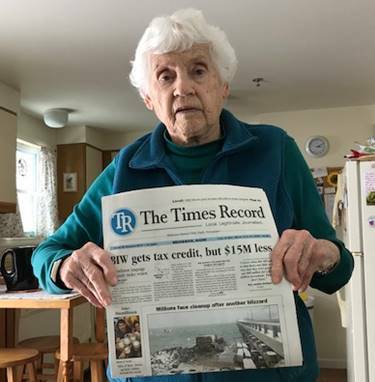 It was only the next day that we heard that the Taxation Committee actually had cut the requested $60 million corporate subsidy bill by 25% to $45 million over 15 years instead of the original 20 year period. In response to your question, both major papers got it wrong. The last series of amendments articulated by Rep. Grant shortened the program by five years and left the same dollar per year cap in place. The total amount, barring acceleration due to massive new hiring, is $45mil. Still a hefty price tag. That certainly wasn’t what I thought they were voting on. And if it’s true then they did an absolutely horrible job of sharing with the public what, exactly, they were voting on. I’ll see what I can find out. Thank you very much for letting me know. Obviously there are a bunch more votes still to come on this. I've yet to hear back from that reporter. The Legislature’s Taxation Committee voted 9-2 Tuesday to deliver a controversial $45 million tax break to Bath Iron Works. LD 1781 would provide the company with $3 million in tax incentives per year over the next 15 years on the condition that it keeps current employment levels and invests at least $200 million in the shipyard. The amended bill marks a decrease of $15 million from the original version, which would have renewed the 20-year, $60 million Shipbuilding Tax Credit enacted in 1997. The measure will now go to the House and Senate for a vote. 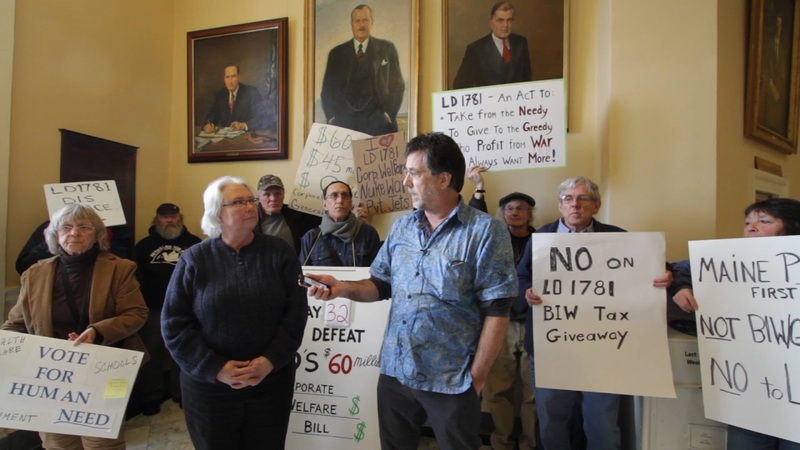 So it is now clear to us that two big things have happened during our statewide campaign to oppose this GD corporate welfare bill here in Maine. First, the largest of four unions at BIW (local S6 Machinists) has declined to endorse the bill which is a huge public relations blow to BIW/GD. Secondly the Taxation Committee rather quietly, and still largely unnoticed, has cut the bill by 25%. In 2013 BIW/GD came to the City of Bath and requested a tax break in the amount of $6.7 million from our very poor city. About six of us ran a city-wide campaign, including going door-to-door, and resident outrage forced the reluctant city council to cut the request in half. If the citizens of Bath (who live alongside BIW) can do that then the state of Maine can say NO as well. We've got hugely neglected issues in this state that need that $45 million - which is peanuts to GD. So full steam ahead. All three of these peace movement leaders in Okinawa were arrested for leading the 13-year daily non-violent protests against US base expansion on their beleaguered island. There are presently 32 US military bases scattered throughout Okinawa taking up about 20% of the total land mass on the island. And the US wants to take even more land due to Obama's 'pivot' of 60% of US military forces into the Asia-Pacific region to encircle China and Russia. Trump is now continuing that policy which means more ports-of-call are needed for Navy warships, more runways are need for US warplanes and more barracks are needed for American troops. The charges against these good men should be immediately dropped. They have already spent months in prison and face much longer sentences. They are only facing further jail time because the US demands it. The Free Press out of Rockland, Maine is the first to report that the S6 (Machinists) union at BIW voted last week not to endorse the GD/BIW corporate welfare bill known as LD 1781. This is big news as the sponsors of the bill (the leadership of Democrat and Republican parties in Augusta) have long maintained that they were doing this bill on behalf of the workers. It now appears that significant numbers of workers at the shipyard don't agree that GD needs $60 million from the state of Maine. We've been told that S6 held a general membership meeting where about 100 workers turned up to vote on whether to support the controversial GD corporate welfare bill. We heard it was a close vote but the union decided not to endorse. Previously we heard from a reliable union source that one of the Machinists at BIW had read the front page story called Ship of Fools in The Bollard publication out of Portland. As a result the worker began educating others in the union about GD's buybacks of $14.4 billion of their own stocks between 2009-2017 and the $21 million in salary for GD's CEO in 2016. It appears that the rumblings among the workers was enough for S6 to sit this one out. S6 is the largest of four unions at BIW. Day 28: Where is the outrage from the 'progressives' on GD corporate welfare? Fellow activist Lisa Savage from Solon, Maine has written a deeply moving blog post today entitled The Shame Of Underfunding Education To Make Fat Cats Even Fatter. Lisa, a leader in our statewide campaign to oppose the General Dynamics corporate welfare bill now being considered at our state capital in Augusta, is a school teacher in one of the most rural and poverty stricken regions of Maine. In my tiny, very poor school district our annual budget is roughly $11 million. The superintendent let the board know recently that, due to a shortfall in the contribution from the state for school year '18-19, we need to cut the budget by around $750,000 in order to keep local taxes from going through the roof. My district has precious little for a tax base besides residential. A few of our towns have a couple of businesses that employ people full time like a wooden flooring mill and a concrete supplier; the town my little preK-5 school is in has a store, a laundromat, two diners, a nail salon and...that's about it. Last week two teachers came to the principal in tears. A Kindergarten student had announced that she would be unable to come to school the following day because her dad had to work to get money to buy the family some food. Her classroom teacher had told me back in the fall that she thought the child's family suffered from food insecurity. We can address this problem for preK-12 because our district is poor enough to qualify for federal aid that feeds everyone who wants it breakfast and lunch every day. Another 1st grader has been living all winter in a trailer with a roof that leaks. Her mom has told the teacher the children will be leaving our school soon as they have a chance to move in with an uncle who has a place to live in another town. General Dynamics, on the other hand, pays its CEO $21 million a year. It has spent $9 billion buying back its own stocks to build value in the shares its top executives receive fat bonuses for increasing. And things are about to get even better: CEO Novakovich recently told shareholders in a conference call that she regarded the federal tax bonanza for wealthy corporations as "a happy event." 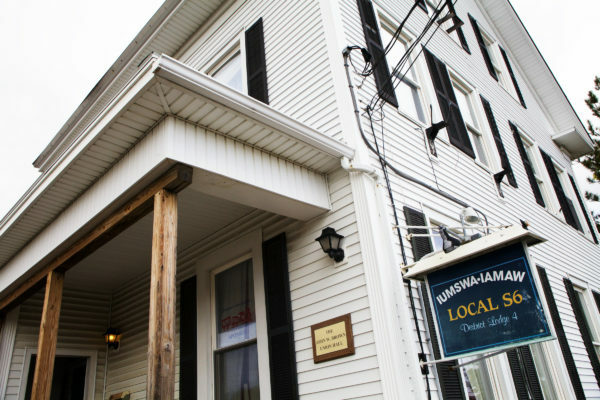 The Maine People's Alliance, a lobbying group for Democrats in Maine, has declined to come out against the bill even though they supposedly stand for funding social needs. Their former executive Ryan Tipping now co-chairs the taxation committee, and he voted ought to pass last week after describing how squeamish he was at doing so. Thanks for your truth telling Lisa. This is exactly why I continue my hunger strike - in solidarity with those living in poverty and neglect across this state. The children who go to school hungry and those tens of thousands in Maine with no health care need all our voices of solidarity badly right now. Where are the voices of the liberal Democrats - either the grassroots or the elected officials from that party? Why are the vast majority of the 'progressive groups' in our state - who claim to represent poor people - virtually silent on LD 1781? Is it because they fear going up against the military industrial complex and have been told by party leadership to sit this one out? It's what I would call half-stepping - these same liberal groups and politicians in Maine howled in outrage when our Republican Sen. Susan Collins voted in favor of Trump's federal tax cut bill in Washington that cut the tax rate of General Dynamics from 35 to 19 percent. But when a similar bill (on a smaller scale) comes before our own state legislature we hear not a mumbling word from the vast majority of them? Why? It's not acceptable to take a pass when one of the biggest weapons makers on the planet steals $60 million from a state that has people suffering in poverty. It is not the job of Maine, or any other city or state, to fund the military industrial complex.